By early summer, the devastating El Niño of 2015 and 2016 had finally subsided. Gone were the calm, gin-clear bathtub temperature waters, as the monsoon season kicked in and temperatures progressively declined to a cool, but coral sustaining 28˚C (82.4˚F). Devastation of the branching, table and plating corals was visible throughout the Maldives, with more than 95% of certain species vanishing in a period of one month. Shallow reef flat communities from 1-6 m had been transformed from flourishing coral gardens with 60-80% living coral to graveyards of brown, algal covered coral skeletons. The acroporids were hardest hit. These were formerly the dominant corals in most Maldivian reefs, and are also one of the most important, providing high relief habitat for hundreds of species of reef fishes. Often, only the hardiest of the massive corals, and a few scattered branching and encrusting corals survived. However, despite initial impressions, we soon realized that hope was not lost. With a bit of searching, we identified numerous survivors – certain reefs provided refuge from the high temperatures, certain habitats fared slightly better, and certain corals appeared to have resisted bleaching. It was these areas that we began targeting as sources of coral for our coral nurseries, but we knew that we had to take precautions to minimize impacts to the remaining coral populations. We also knew that we needed to introduce a novel approach to the Maldives to grow corals – one that was non-destructive to source populations, while generating hardy colonies that could be used to restore and rejuvenate damaged areas. Of the 1,192 islands that make up the 26 atolls in the Maldives, most are remote and uninhabited. While this certainly helps maintain healthy reefs, there are also about 200 inhabited islands, more than half of which are resort islands. These resorts, as well as the 276 safari boats that circumnavigate the reefs, provide most of the jobs and income for Maldivians, but their survival is integrally linked to healthy reefs through snorkel and dive tourism. Most visitors come to the Maldives to view iconic marine life which includes manta rays, whale sharks, turtles, and various reef sharks, but these species as well as the associated reef fish and invertebrates rely on flourishing coral communities and both will disappear once the coral vanishes. 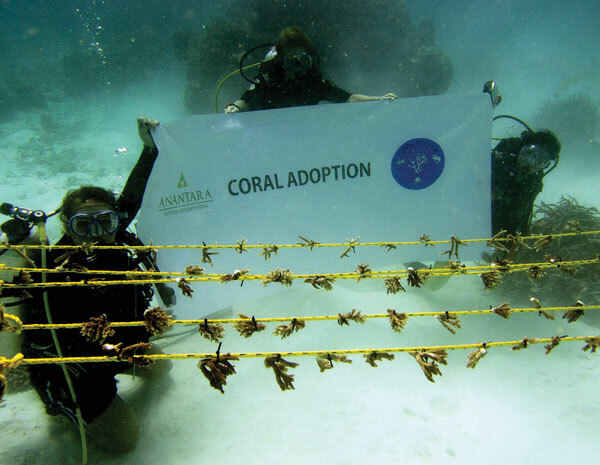 Traditionally, many of the resorts offered guests an opportunity to contribute to reef conservation by supporting “adopt a coral” programs. The guests could purchase a metal (rebar) frame to which small coral branches were attached. These were generally placed in a shallow lagoon close to the resort, and photographed monthly to quarterly so that the guests could witness the growth of “their” corals. Sadly, very few of these survived the high water temperatures in April/May 2016, largely because they were located in very shallow lagoonal habitats where water circulation was minimal and temperatures climbed to extreme levels (33-35˚C). 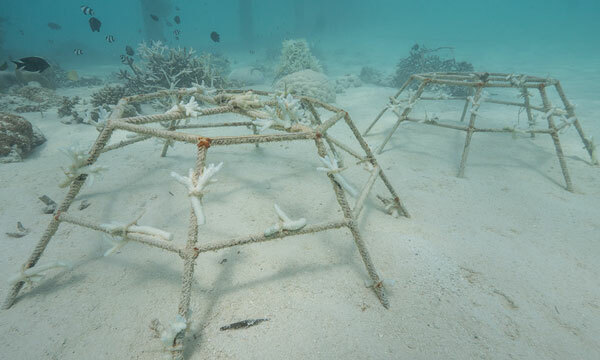 These frames had other drawbacks- they would eventually rust, they were easy targets for crown of thorns starfish and other coral predators, and it was virtually impossible to remove the corals from the frames for use in reef restoration. Older, traditional coral frames have been used throughout the Maldives. Very few hold corals that survived the bleaching event. 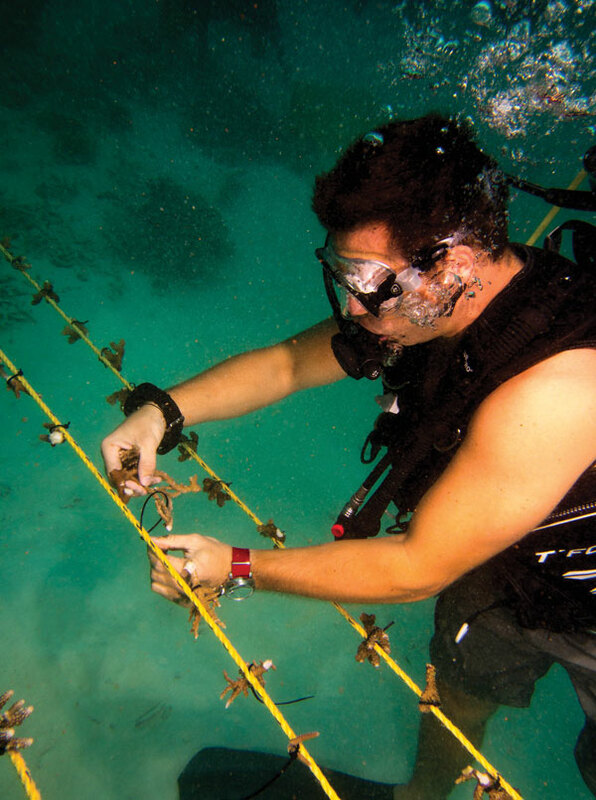 Using lessons learned in the Caribbean, the Coral Reef CPR team chose to establish coral nurseries using plastic mesh covered tables raised about 1 m off the seabed and nylon ropes suspended in the water column. This minimizes smothering by sediment and algal growth and also prevents coral losses due to predation. Rope nurseries have an added benefit of additional water circulation and smaller predators such as the coral-eating gastropod Drupella cannot climb onto the ropes. They are easier to maintain, as the ropes can be gently shaken to remove any trapped sediment or algae. We also chose to use nylon and plastic as the coral fragments appear to readily fuse and grow over this, and the resulting corals can easily be removed when transplanting to the reef. One of our rope nurseries. Each 16-foot (5-m) rope holds 50 coral fragments. Between August and November we established small nurseries in six locations on South Malé Atoll near Anantara Dhigu and Veli, and two on Baa Atoll, near Anantara Kihavah. We selected different habitats and depths, which will allow us to determine optimal growth rates and species and to grow species that can be transplanted to reefs with similar environmental conditions. We also selected certain areas that are frequented by snorkelers and dive boats, placing them in areas that formerly had coral but suffered catastrophic mortality. Our sites include a shallow lagoon that was formerly dominated by flourishing stands of staghorn coral, a sand slope on a pinnacle reef, a rubble slope on an outer reef, a protected deeper sandy lagoonal channel and a sand flat within a leeward lagoonal reef. Our nurseries range from 2-15 m depth. 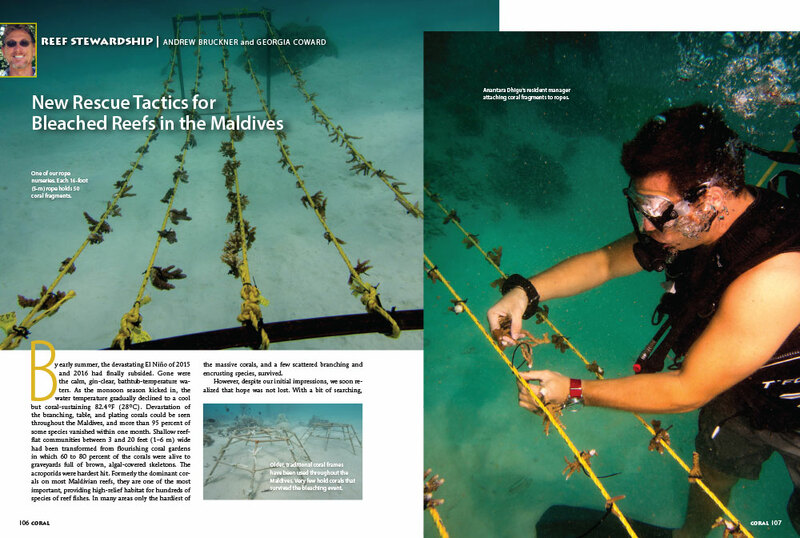 Anantara Dhigu’s resident manager attaching coral fragments to ropes. We are using “fragments of opportunity” in all of our nurseries. This means all the corals we are using are sourced from broken, damaged or diseased corals and corals that would otherwise die. We find a large number of broken fragments on the reef slope that survived the bleaching, but are being buried by sediment and have lost parts of their tissue. For an unknown reason, these were detached from corals on the reef flat and carried down the slope. These fragments survived the intolerable environmental conditions, while the “mother” colonies in the shallows bleached and died. These are also one of the main targets of coral-eating snails. We have found more than 200 snails on some fragments, concentrated on the underside and slowly consuming the tissue. Hence, removing these fragments saves them from uncertain death. We are also discovering an increase in coral disease among colonies that bleached and survived. 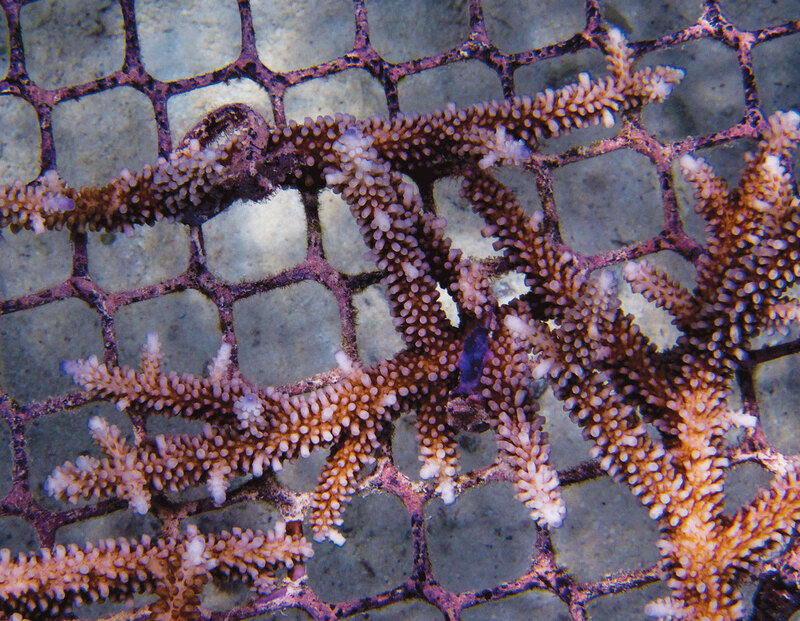 Black band disease and white syndrome manifest on the coral after it has regained its pigmentation and slowly advances up the branches or radiates outward across a table or plate. When left alone, these coral fragments will die. However, we can clip off the ends of the branches, away from the disease, and the fragment usually survives. Dredging and sand extraction sites provide another source of corals that would otherwise be buried or crushed. Throughout the Maldives, most local and resort islands are regularly extracting sand to reclaim land lost during the previous monsoon season and to address rising sea level. 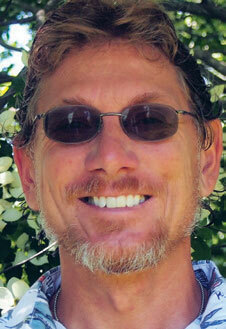 This is typically done in the vicinity of a coral reef, and the outcome is a dead reef. To supply one nursery, we identified a large unusually diverse population of small acroporids (1-5 cm recruits and juveniles that were starting to develop branches) that had settled onto dead coral rubble. There was an active sand extraction project in this area that would overturn and bury the rubble. By delaying the start of the project, we were able to collect many of the corals that would have otherwise died. Because the corals are already stressed, we do expect to lose a portion of these. However, we minimize stress by transporting these underwater and fragmenting and attaching them to our mesh and rope within a few hours of collection. Our pilot nurseries established in July/August showed unusually high survival. We planted over 1,000 corals in five areas and had between 80-95% survival after three months, and new growth had already occurred. The main cause of mortality was predation by Drupella, with some fragments bleaching and succumbing to disease. We attempt to place corals at the same depths from which they were collected, as transplantation of colonies from deep water to shallow nurseries inevitably results in bleaching. 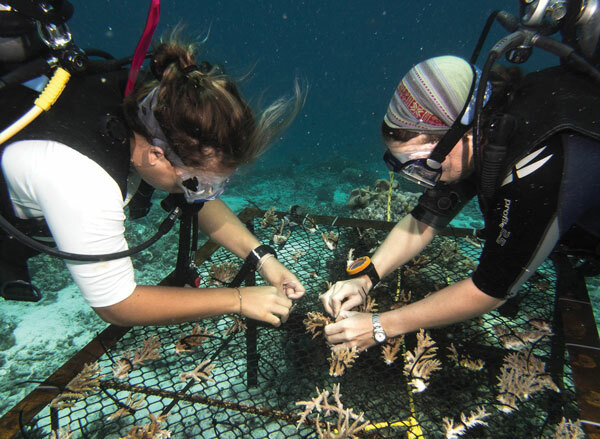 Our team attaches coral fragments to a nursery table on South Malé Atoll. During October/November, we expanded all of the five original nurseries and established nurseries in three new locations, emphasizing our rope nurseries. For these, we extend 5-10 m pieces of 3/8 nylon line between two metal “staples” and attach 30-50 fragments with cable ties to the rope. One of our nurseries is located within a very shallow lagoon that lost 99.5% of its coral. This site formerly had flourishing staghorn coral stands and served as a critical nursery area. It was also easily accessible by tourists. We placed rope frames in this site, using small branches of the same species that were being rapidly consumed by coral eating snails. Once the fragments grow into small bushes (15-18 cm), they will be transplanted back into the area to begin reestablishing the population. The key to our transplantation is to place colonies of a single species, but different genetic individuals, into small clusters, so these can reproduce and produce larvae that will recolonize other areas. 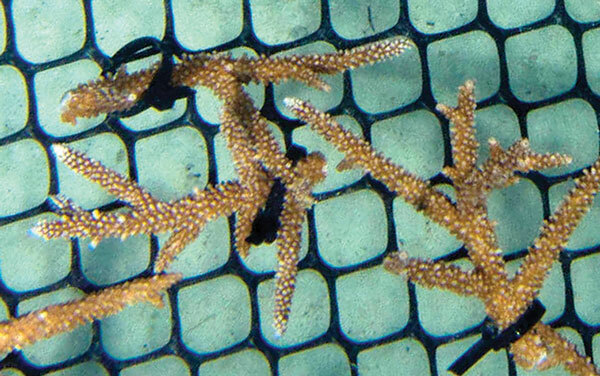 Acropora fragments on a new coral nursery table. The same Acropora fragments display amazing survivorship and growth after just two months. 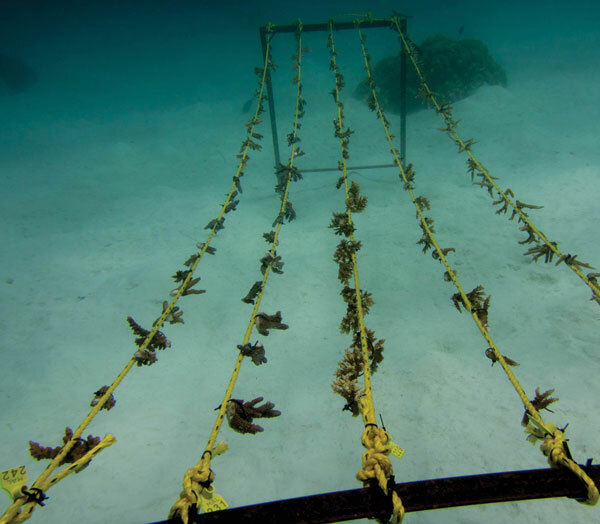 Our intent is to allow these fragments to grow for 15-18 months before transplanting them to neighboring reefs, while concurrently adding new rope frames and mesh tables to each site and expanding nursery areas into new locations. Our main challenge thus far is finding funding to purchase necessary supplies and to support local Maldivians that help maintain the nurseries, as well as adequate man power to build nurseries in new areas. To combat this, we are offering exciting opportunities for corporate and individual sponsorships to support our vital conservation efforts. This includes the opportunity to purchase a rope, a coral frame or a restoration plot. We place your name on a plaque at the nursery and you can follow your coral’s growth online, knowing that you are actively helping to restore a reef. We also sell our team t-shirts, where all donations are used to continue establishing coral nurseries throughout the nation. Support our conservation and rehabilitation efforts— adopt a rope or table now! Visit coralreefcpr.org for more details to make a difference.